Established in 1998, Lord & Butler Model Railways is the business partnership of modelling enthusiasts Adrian Butler and Peter Lord. 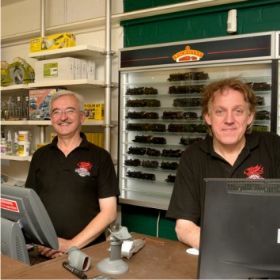 The business is major stockists for leading UK and world recognised brands of model railway locomotives, accessories, scenery and much, much more. Lord & Butler Model Railways carries a great deal of new, limited edition, collectables and second hand product for all gauges. We are also reknowned throughout the United Kingdom for our locomotive and rolling stock weathering service, known as Dirty Boy! Formerly housed in Cardiff's Pumping Station, the business doubled in size during the summer of 2013, relocating just a "stones throw" away to new premises and underwent a rebranding. For years now we've welcomed visitors from all around the United Kingdom and beyond. Since the move to new premises further investment has been made and Autumn 2014 saw the launch of www.lordandbutler.com, allowing customers from anywhere in the United Kingdom to browse, order and purchase online. From Lord & Butler Model Railways, we offer a big thank you to all of our loyal customers and we look forward to seeing you all soon at the many events we attend.